On Saturday, December 19, 2009 David Carroll Morgan passed away in Comanche, Oklahoma. His funeral was held at 2:00 p.m. on Tuesday, December 22, 2009 at Patterson Avenue Baptist Church, Comanche Oklahoma. Services under the direction of Comanche Funeral Home. Brother Trent Young Officiating. He was buried at Fairlawn Cemetery, just North of Comanche. David's wife Elizabeth was there and I was not able to chat with her. His son John Morgan and John's wife Krista were there. They are from Sterling, Oklahoma. There was also four grandchildren present-Brennan and Hudson Morgan of Sterling, OK and Kyra Allen of Dallas, TX and Amber Benson also of Dallas, TX.David ties into the Sharp-Poole connection through his mother Eva Sharp Morgan. My grandpa Verb Sharp was David's mother's brother, or David's Uncle Verb. Then it goes back through Verb and Ev's mother Mary Verna Lee (Vernie) Poole. I had planned to go and visit with David so many times. He kept inviting me to come and look at old pictures with him. I waited too long. David was a born again believer. He had a huge funeral. Many many people that I did not know. They took turns talking about how much fun he was and how he loved to sing and how he had all the pages of the hymn book memorized. He LOVED sports. He followed the teams of Comanche and Sterling with amazing dedication. I guess he NEVER missed a game. I remember hearing years ago that David had a daughter who was murdered in Comanche and the crime was never solved. I kind of think that HER name was Elizabeth. David is buried next to her. He reminded me so much of his Uncle Bawley (Oscar Vansler Sharp). He looked just like him and had his full of fun personality. April 13th of 1930. Their last child, Bobby, will be born April 3, 1931. Grandma Nancy states that she is 35 and Grandpa Verb is 29. They are Farmers and they own their land. Almost right next door lives my Great Grandparents, Fuzzy and Vernie. Fuzzy's real name was Carrol and Vernie's full name was Marylee Verna. He is 51 and she is 49. Mirl, 23 Eva, 20 and Oscar,18 are still at home. So Vas has left home (he married Lacy Barton in 1922) and of course Grandpa Verb is living nearby. In ten short years their lives will be turned upside down. They will sell their farm and head for California. They have not experienced the dust yet, nor the Great Depression. Life is hard but so good compared to what lay ahead of them. Amanda was born in Feb 1874 in Arkansas City, AR...only a stones throw from the mighty Mississippi River. Her parents were Marion Johnson, b: 20 Apr 1839 in AL, and Martha Dickerson, b: 28 Feb 1845 in Tennessee. Sisters, Martha E, age 9, Tulda, age 4, Vicy, age 1, and her cousin Sarah Mitchel, age 16. In 1900, at the age of 26, Amanda was living with her parents in Township 8, Choctaw Nation, Indian Territory. Also in the home are Sisters Vica (Should be Vicy) age 20, Millie, age 18, and a Brother Jesse, age 14. (On 25 Aug 1905, the Mother of Amanda passes away in Slaytonville, Sebastian County, AR) In the year of 1910, in Cameron, LeFlore County, OK, you will find Amanda, at the age of 36, living with her Father Marion, listed as age of 70. 11 Apr 1915, Moses Greenworth Pool and Amanda (Mandy) Levinia Johnson get married in Cameron, LeFlore County, OK. He was 60 and she was 41. 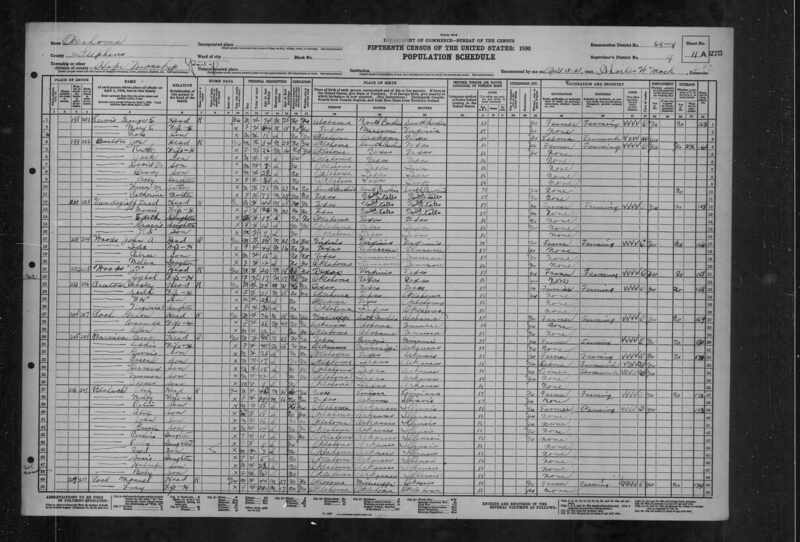 The year 1920 shows Amanda and Moses residing in Poteau, LeFlore County, OK with one child. Son Allen Preston Pool, listed as age 2. In 1930, they are residing in Hope, Stephens County, AR. Moses is 76, Amanda is 56, and Allen Preston is 12. 10 Dec 1941, Amanda "Mandy" Levenia (Johnson) Pool marries Henderson Andrew Foy Boatman in Duncan, Stephens County, OK. The year Amanda "Mandy" Johnson passes away is still a mystery to me, but it is my understanding that she too is buried in Comanche, OK near Moses Greenworth Pool. On 5 Jun 1942 Allen Preston enlists into the U.S. Army at Oklahoma City, OK. His enlistment records show his city and state of residence as Madera, California. His marital status is listed as separated with no dependents. He enlisted for the duration of the war plus 6 months as a private for the Warrant Officer program. On 7 Jun 1943, Allen marries Verna Viola Ferguson in Colorado Springs, CO. It is my understanding they have two children, but I cannot confirm this. Allen Preston Pool passed away in Portland, OR in either 1950 or 1957. Cause of death is unknown. I cannot find a record of death for Allen. 1783 in North Carolina, died 1852 in Warren Mississippi. This information matched about as close as I think I am going to get so I am staying with it. Besides, just think about it for a minute folks... How many men do you know that was born in Tennessee, lived in Mississippi and named a daughter, Missouri? There's gotta be something to this. Ivy Ann Jarvis, daughter of Nancy Rouse Jarvis and James Wesley Jarvis, married Pugh Cannon Sharp in Greenwood in 1901. Pugh's family had moved to Arkansas in the 1860's from Lauderdale County, Alabama. Pugh's father Charly and Grandfather Adron, owned land on both sides of what is now Highway 10, east of Booneville Creek. Ivy's family had moved from Gun Town near Tupelo, Mississippi, when Ivy was eight years old. The started out in two covered wagons pulled by oxen. When they reached the Mississippi river, the crossed on a ferry. After crossing the river, they sold their teams and wagons and boarded the Iron Mountain Railroad train fro the long ride to Fort Smith, Arkansas. When they arrived in Fort Smith, they bought wagons and teams for the final part of the journey into the Indian Territory. They settled in a place called Culla Cha haw, near Poteau. While Ivy was living at Culla Cha Haw, she met Pugh Sharp who was visiting relatives at Poteau. Pugh and Ivy settled at 211 South Bennett Street in Booneville, where they operated a neighborhood store . they had five children who lived to be grwon. Bessie, who married Otto Osborne, is buried at Old Union Cemetery west of magazine. Stella, who married Earnest Harper, lives in Booneville, Iva, who married Herman Hunter and Charely Godfrey lives at Maumelle, Arkansas. P.C. Jr. married Violet Robertson and Billie Jean Brown and is buried at Oak Hill Cemetery in Booneville. Jewell Dean died in 1946 at eh age of 20 and is buried at Oak Hill Cemetery. Pugh died in 1930 and Ivy in 1971. Both are at rest in the Oak Hill Cemetery. 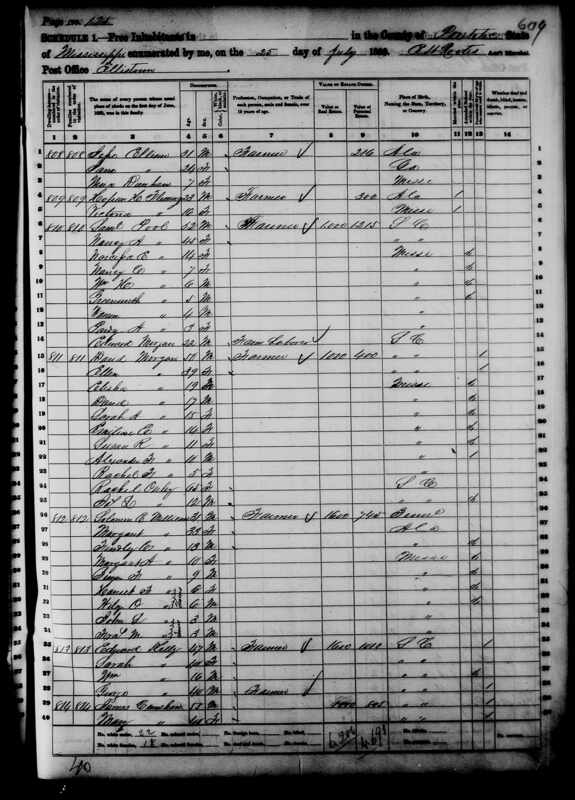 Here's the 1860 census page for Samuel Pool when he was 52 and Moses Greenworth was only 5 years old. This one shows Moses Greenworth, Missouri, and just Manuel when he was 22 years old. 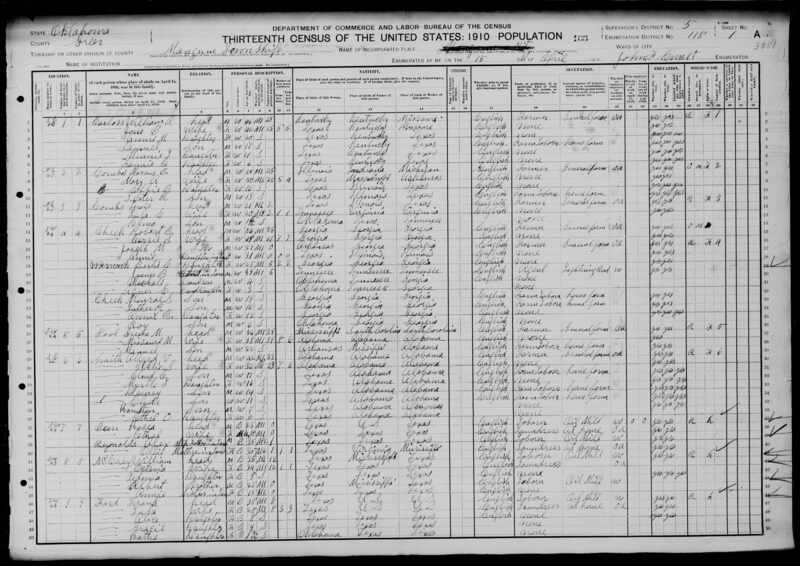 This is the census record for Manuel and Lucy Pool. My Dad, Lyndell Pool, was just a few weeks from his 3rd birthday.